This striking succulent spreads slowly to form a dense carpet of silvery-gray finger-like foliage. The upright sturdy flower stems rise boldly 15-18" above the foliage. 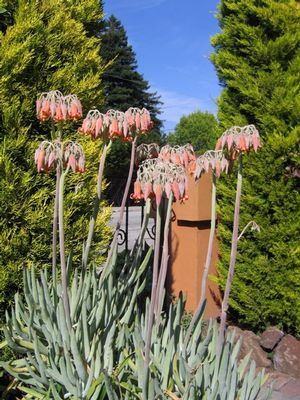 Clusters of bell-shaped salmon flowers dangle from the tip of the stem like an outrageously over-the-top candelabra! 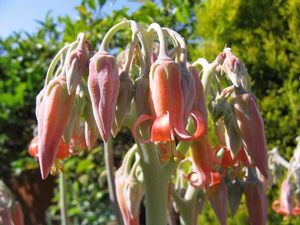 Maintenance of this succulent is minimal and easy; just cut the flower stems off at the base when the flowers have died. If you need to reduce the width of the plant, cut back the stems as required.